The Anaheim Ducks face an interesting next couple of weeks as the expansion draft approaches. Their issues stem from having four quality defensemen they’d like to keep. On top of the salary cap maneuvering that would require in future years, the parameters around the expansion draft complicate matters further. In figuring out what to do about their defensemen, the Ducks also have to consider the ripple effects those decisions will have on their forwards. One forward who could get caught in the crosshairs of this impending storm is 26-year-old Swede Jakob Silfverberg. The Ducks, though, have to prioritize keeping Silfverberg, even if it means losing one of their quality blueliners. 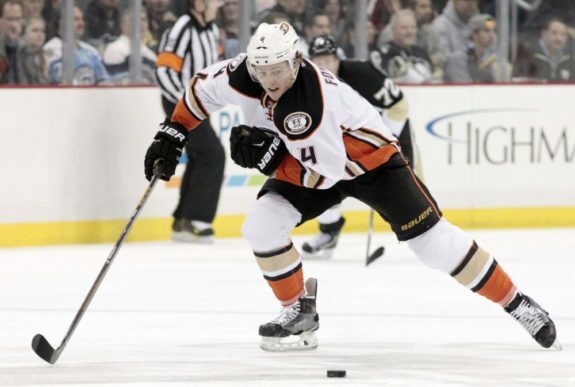 A second-round pick of the Ottawa Senators in 2009, Silfverberg was traded to the Ducks in 2013, along with Stefan Noesen and a 2014 first-round pick (which became Nick Ritchie), for Bobby Ryan. Silfverberg, a right winger, came over and proved to be a solid depth scoring threat, but broke out in 2016-17—his fifth NHL season—when he became a player crucial to the Ducks’ success. After never reaching the 40-point plateau, Silfverberg compiled 49 points in 79 games this past season. That included a career-high 23 goals, which was the second-highest total on the team. He raised the level of his game even further in the postseason, as the Ducks came to within two wins of reaching the Stanley Cup Final before bowing out to the Nashville Predators in the Western Conference Final. Silfverberg did his part, leading the team in playoff goals with nine and ranking second in points with 14 in 17 games. Over the course of the regular season, Silfverberg’s shooting percentage was a career-best 10.1 percent. While a high shooting percentage over one season is often a red flag for unsustainable production from year to year, there is not much cause for concern in Silfverberg’s case. First, his regular-season mark of 10.1 percent was just slightly above the league average, which was 9.0 percent. Second, the bigger question resides on the opposite end of the spectrum: with Silfverberg’s lightning-quick hands and shot release, how has his shooting percentage not been higher? Last season, Silfverberg’s shooting percentage of 9.3 percent was his career-best to that point, so the evidence points to him continuing to figure out how to pick his spots and make the most of his talents. His prowess in the shootout also underscores the strengths of his game; Silfverberg has a career success rate of 52.8 percent (19 for 36) since breaking into the NHL. That’s good for sixth-best in the league over that span. One of the most exciting traits about Silfverberg is that he has shown steady improvement over his young career to this point, culminating this year with his best season yet. The last two seasons have seen a noticeable uptick in his goals per 60 minutes (G/60), aligning with the 20 he scored in total in 2015-16 and the 23 he scored this season. His G/60 numbers since joining the Ducks are illustrated below. The Ducks made an investment in Silfverberg when they traded away Ryan, and the returns are really beginning to roll in. 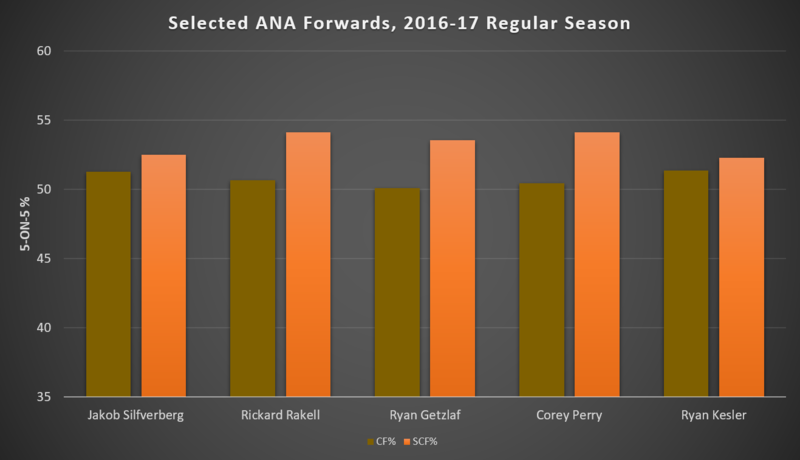 With respect to possession and his ability to generate scoring chances, Silfverberg’s metrics do not look out of place next to those of Anaheim’s big-name forwards, which include emerging star Rickard Rakell and veterans Ryan Getzlaf, Corey Perry, and Ryan Kesler. Silfverberg’s 2016-17 regular-season Corsi-for percentage of 51.3 was very strong. He also stayed on the right side of the scoring chance differential, as 52.52 percent of the scoring chances that occurred while he was on the ice were for the Ducks. Despite Silfverberg’s increasingly important role with the Ducks, he could become the victim of a numbers game with the expansion draft. Even if the Ducks buy out deteriorating blueliner Kevin Bieksa’s contract or manage to get him to waive his no-movement clause (NMC) for the expansion draft, defensemen Hampus Lindholm, Cam Fowler, Sami Vatanen, and Josh Manson would still be in need of protection slots. If the Ducks wanted to keep all four of these quality defensemen, then they would only be able to protect four forwards (and one goalie). Getzlaf, Perry, and Kesler all have NMCs, so they are not going anywhere barring something dramatic. The Ducks likely would not expose anyone from that trio anyway, as they are all ingrained as key members of the team and still performing at a high level (if we temporarily ignore the 32-year-old Perry’s somewhat down year by his standards; he still had 53 points). That leaves one forward left who could be protected. Rakell, who is only 24 years old, would have to be that player. 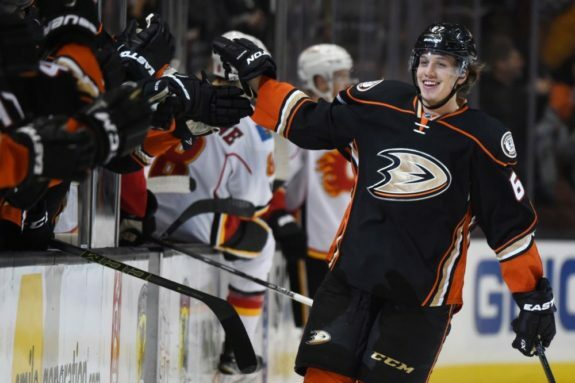 Like his fellow Swede Silfverberg, Rakell enjoyed a breakout season, leading the Ducks with 33 goals. He appears to be on the verge of stardom. That would, however, leave Silfverberg exposed. That being said, the Ducks can avoid this situation if they deal from their position of strength: defense. They must avoid using a protection slot on Bieksa, and with just one year remaining on his contract, a buyout would be a decent option—even with his cap hit of $4 million still counting in full—if he does not agree to waive his NMC. Then they would have to look to trade one of their four aforementioned defensemen. Lindholm, 23, is probably the team’s best defender and is signed through 2021-22 at a bargain annual cap hit of $5.2 million. He isn’t going anywhere. That leaves Fowler, Manson, and Vatanen, the latter of whom, like Lindholm, will be recovering from shoulder surgery as the 2017-18 season commences. While the Ducks are in a bit of a dilemma in that they will lose a quality player before the expansion draft is over, they do have several options at their disposal. They could look to deal Fowler, the 25-year-old who had arguably the best season of his career and will be in line for a serious raise after this season, as he is set to hit unrestricted free agency at that point. Given his perceived value around the league thanks to the recency of his most consistent season, as well as the mega-contract that is nearly guaranteed to come his way soon, he might be the best option for the Ducks to move. Nevertheless, the Ducks have other options if they want to keep Fowler. 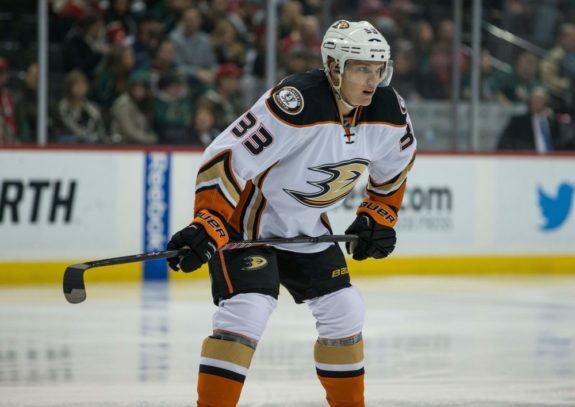 Vatanen, also 25, is one such alternate option to trade. He is signed to a reasonable contract that carries an annual cap hit of less than $5 million through 2019-20. While that makes him an attractive trade piece, it’s possible some teams might shy away from him because of his injury issues (though that would probably be somewhat shortsighted). Manson, yet another 25-year-old, is another player who really solidified his role as a key player for the Ducks this season. He is due to become a restricted free agent after next season, so the Ducks could opt to trade him before his next contract. In any event, the Ducks have to trade one of these three defensemen if they want to keep Silfverberg. Each one would have plenty of value on the trade market, so it would make no sense to simply expose one of them in the expansion draft and likely lose that player for nothing. If the Ducks make such a move, they could use the seven forwards/three defensemen/one goaltender protection scheme. On the back end, they would protect Lindholm and whichever two of Fowler, Vatanen, and Manson are not traded. They could then protect Getzlaf, Perry, Kesler, Rakell, and Silfverberg, in addition to two more forwards. The Ducks should be able to glean solid value by trading one of their defensemen. Such a move would also allow promising youngsters Brandon Montour and Shea Theodore to take on increased responsibility on the back end. 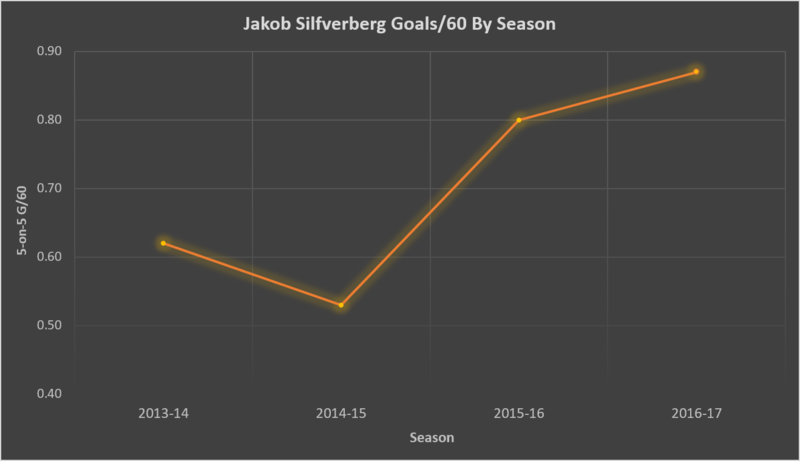 The big win, though, would be keeping a rising young scorer in Silfverberg. G/60 data is at five-on-five, via Stats.HockeyAnalysis.com. CF% and SCF% data is also at five-on-five, via NaturalStatTrick.com.